This generously filled 2CD set offers the near‐complete orchestral works by Maurice Ravel. Ravel’s oeuvre is small but of an exceptionally high quality, crafted by a perfectionist. His orchestral works are set in extraordinary colours and timbres, and the orchestration betrays the hand (and ear) of a genius. Most of Ravel’s orchestral works belong to the standard concert repertoire, ideal vehicles showing the quality of the performing orchestra and conductor: the world famous Boléro, the two Daphnis and Chloe suites, the delirious La Valse, the atmospheric Rapsodie Espagnole and the fairylike Ma mere l’Oye. 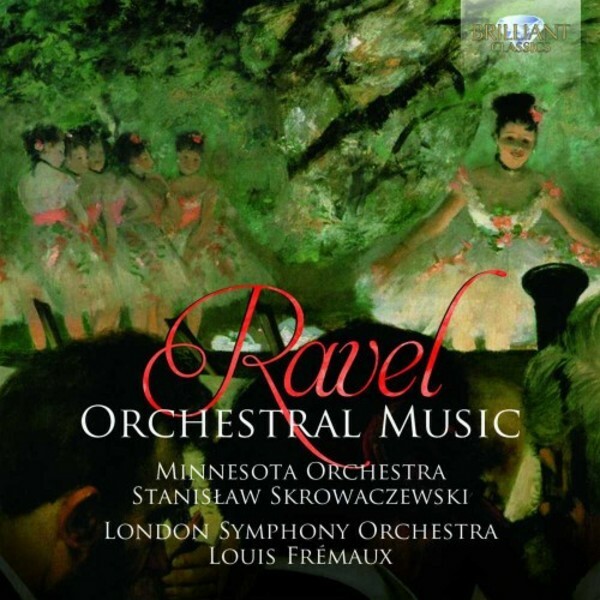 The works are split between the world‐class London Symphony Orchestra (under Louis Frémaux), which performs Boléro, La Valse and Daphnis et Chloé with its characteristic flair, and the Minnesota Orchestra (under Stanisław Skrowaczewski), whose initial release of this music was described as "glittering" and "stylish" by Gramophone magazine. This repertoire portrays Ravel at his most scintillating and offers a perfect introduction to the captivating music of this French composer.